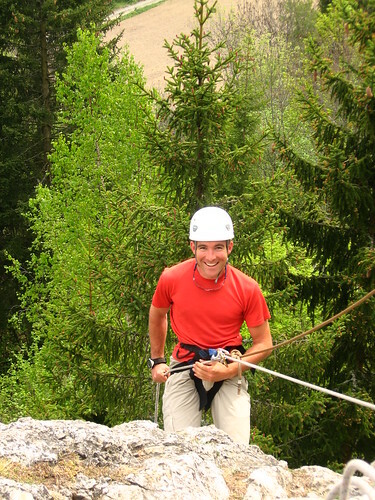 This week has been staff orientation week for the staff working at the Village Camps spring outdoor education programmes in Anzere, Switzerland. I am one of those staff, and without a doubt the most inexperienced when it comes to leading in the outdoors. It has been a massive learning curve for me. There are about 14 camp counsellors this year, with about 9 attending the pre-camp orientation week. After 8 months on the road alone, it is great being with other people. It is also a challenge, as I now have to think not only about what I need, but the needs of others around me also. The other camp counsellors are from diverse backgrounds. Countries include Poland, France, Canada, England, Ireland. There are professional teachers, snowboard instructors, mountaineers. All with a lot of experience. Village Camps has a strong emphasis on environmental awareness. Their programmes actively encourage the participants to connect with their physical environment, and become active in understanding their part in being a responsible citizen of earth. And here I was breaking off a dead branch of a pine tree to make a pole for my makeshift shelter. It is as much a course in awareness for me as it is for the participants. That was the point behind reviewing our map reading and navigation skills. We learned about scale, guestimating distance, giving grid references, and estimating times to and from set locations. All along the trail, our instructor and program coodinator, Anthony, was giving us eco-nuggets. Small pockets of information about the surrounding area. 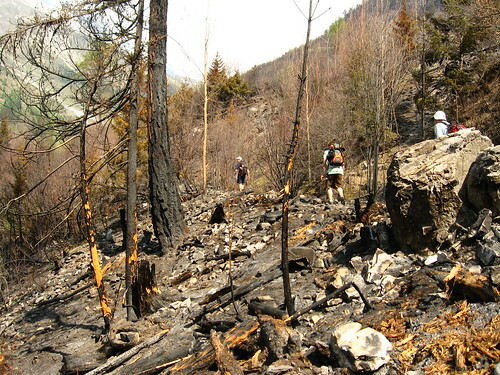 At one stage we walked through an area of bush that had recently been destroyed by forest fire. The air was still pugnet with the smell of scorched earth and wood. A crash course on group management at a rock climbing site. 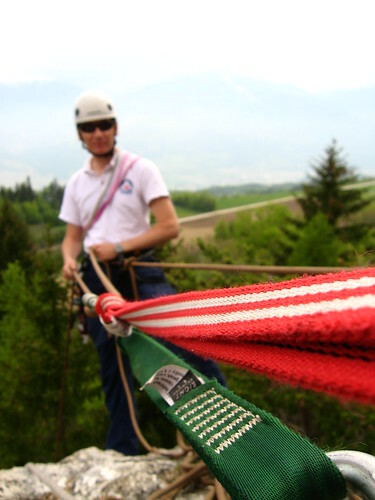 There is a specialist who does the actual instructing, but as a group counsellor, I am responsible for ensuring that the group is controlled and safe around the climbing site. Outdoor living skills and map making were the name of the game today. Another hard day of learning. 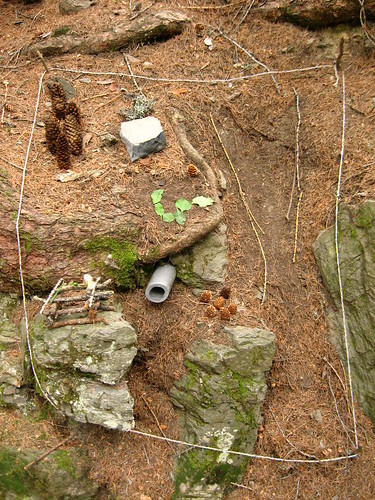 The photo above shows a simple activity whereby a group member makes a ‘landscape’, hides some treasure somewhere in it (a drawing pin), and then makes a map representing the landscape, showing the location of the treasure. Us 9 counsellors were split into three groups, and given instructions to make our way to Lake Tzeuzier. We were to be sure to keep practising our map reading skills. Each group would be called at least twice during the day to report on our exact location. Once at the lake, the next challenge was to construct a shelter. My group chose a tall rock to make a lean-to shelter against. Nothing I wasn’t used to, but at 1,850m in altitude, it was a cold night. The first group of students arrive tomorrow. Sixty 9 to 10 year old students from Zurich International School for their five day program. It has been an intense and full orientation and training week, but I feel prepared. Well, this is certainly a lot different to managing on your own! Just make sure you don't take your group of hikers to 'what looks like an interesting place to go' – keep to your original instructions and follow the map! 9-10 yr olds – were you expecting that age group? better 9-10 years olds than 14-16's cos they'll be trying to run off and have illegal raves in the woods and that's a the start of it! You'll be fine just keep an eye on the kids count'em every now and then to make sure you've got the same number as you started with. I am sure you will do well, remember that little camp we did in Aso while we were at APU? Ha! I bet that seems like kids play compared to this thing eh. still it sounds like a perfect thing for you and I have no doubt you'll be even bettter at "The Great Outdoors" when you are finished. Hey Rob, that's really interesting! I know some of these tasks from working with my mother and our specially trained searching dog. And I know that it's really great fun! All the best and have phun! no need to stress rob. if you lose some kids on the first week, then you might find them again during the second week- and then the found ones will replace the ones you lost on the second week, and so on. easy. just means that you will have to hang around an extra week looking for the kids you will lose on the final week. In any case, this is great experience and exactly what you wanted to do after the trek, right? Well, I am back from Madison. I had a great time catching up with everyone there and really found it hard to come back to the office. It is a bit warmer now at least though. Best of luck with the camp and enjoy it! You will likely end up learning as much as the kids you are in charge of, I am sure. I had a lot of fun being in your group. I hope we meet again someday! I knew your name was Rob!!!!!!!!!!!!!! One day you should come to Zurich and visit us at ZIS. Hi Weka or should I say Rob? Had a great time with u! Hope 2 meet u again. I will keep an i on your website. This is where craving for adventure bites back!! Hope you're time with the kids at the camp is going well.